The Cathedral of the Most Holy Savior and of Saints John the Baptist and the Evangelist in the Lateran, (Italian: Santissimo Salvatore e Santi Giovanni Battista ed Evangelista in Laterano) – also known as the Papal Archbasilica of St. John [in] Lateran, St. John Lateran, or the Lateran Basilica – is the cathedral church of the Diocese of Rome in the city of Rome and serves as the seat of the Roman Pontiff. It is the oldest and highest ranking of the four papal major basilicas, giving it the unique title of "archbasilica". Because it is the oldest public church in the city of Rome, it is the oldest and most important basilica of the Western world, and houses the cathedra of the Roman bishop, it has the title of ecumenical mother church of the Catholic faithful. The current archpriest is Angelo De Donatis, Vicar General for the Diocese of Rome. The President of the French Republic, currently Emmanuel Macron, is ex officio the "first and only honorary canon" of the archbasilica, a title that the heads of state of France have possessed since King Henry IV. The large Latin inscription on the façade reads: Clemens XII Pont Max Anno V Christo Salvatori In Hon SS Ioan Bapt et Evang. This abbreviated inscription translates to: "Pope Clement XII, in the fifth year [of his Pontificate, dedicated this building] to Christ the Savior, in honor of Saints John the Baptist and [John] the Evangelist". The inscription indicates, with its full title (see below), that the archbasilica was originally dedicated to Christ the Savior and, centuries later, co-dedicated to St. John the Baptist and St. John the Evangelist. As the Cathedral of the Pope as Bishop of Rome, it ranks superior to all other churches of the Roman Catholic Church, including St. Peter's Basilica. The archbasilica is sited in the City of Rome. It is outside Vatican City, which is approximately 4 kilometres (2.5 mi) to its northwest, although the archbasilica and its adjoining edifices have extraterritorial status from Italy as one of the properties of the Holy See, pursuant to the Lateran Treaty of 1929. Next to the formal entrance is the archbasilica's declaration to be the head, or Mother Church, of the entire world. Note the laurel wreath and the Papal tiara. The archbasilica's Latin name is Archibasilica Sanctissimi Salvatoris ac Sancti Ioannis Baptistae et Ioannis Evangelistae ad Lateranum, which in English is the Archbasilica of the Most Holy Savior and Saints John the Baptist and John the Evangelist at the Lateran, and in Italian Arcibasilica [Papale] del Santissimo Salvatore e Santi Giovanni Battista ed Evangelista in Laterano. The Lateran Palace fell into the hands of the Emperor when Constantine I married his second wife Fausta, sister of Maxentius. Known by that time as the "Domus Faustae" or "House of Fausta," the Lateran Palace was eventually given to the Bishop of Rome by Constantine I. The actual date of the donation is unknown, but scholars speculate that it was during the pontificate of Pope Miltiades, in time to host a synod of bishops in 313 that was convened to challenge the Donatist schism, declaring Donatism to be heresy. The palace basilica was converted and extended, becoming the residence of Pope St. Silvester I, eventually becoming the Cathedral of Rome, the seat of the Popes as the Bishops of Rome. Pope Sylvester I presided over the official dedication of the archbasilica and the adjacent Lateran Palace in 324, changing the name from "Domus Fausta" to "Domus Dei" ("House of God") with a dedication to Christ the Savior ("Christo Salvatori"). When a cathedra became a symbol of episcopal authority, the papal cathedra was placed in its interior, rendering it the cathedral of the Pope as Bishop of Rome. When Gregory the Great sent the Gregorian mission to England under Augustine of Canterbury, some original churches in Canterbury took the Roman plan as a model, dedicating a church both to Christ as well as one to St. Paul, outside the walls of the city. Ironically the church name "Christ Church" so common for churches around the world today in Anglophone Anglican contexts originally came from this Roman church, central to pre-medieval Christian identity. The high altar and the 14th-century Gothic ciborium. By legend, the relic of the original wooden altar used by St. Peter comprises the high altar. Above the ciborium are the appearances of Sts. Peter and Paul. On the archbasilica's front wall between the main portals is a plaque inscribed with the words "Sacrosancta Lateranensis ecclesia omnium urbis et orbis ecclesiarum mater et caput", which translate to "Most Holy Lateran Church, mother and head of all the churches in the city and the world"; a visible indication of the declaration that the basilica is the "mother church" of all the world. The archbasilica and Lateran Palace were re-dedicated twice. Pope Sergius III dedicated them to St. John the Baptist in the 10th century in honor of the newly consecrated baptistry of the archbasilica. Pope Lucius II dedicated them to John the Evangelist in the 12th century. Thus, St. John the Baptist and St. John the Evangelist became co-patrons of the archbasilica, while the primary Patron is still Christ the Savior, as the inscription in the entrance indicates and as is traditional for patriarchal cathedrals. Consequently, the archbasilica remains dedicated to the Savior, and its titular feast is the Feast of the Transfiguration. The archbasilica became the most important shrine of the two St. Johns, albeit infrequently jointly venerated. 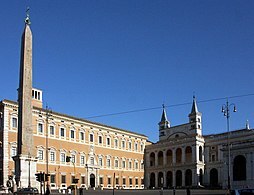 In later years, a Benedictine monastery was established in the Lateran Palace, and was devoted to serving the archbasilica and the two saints. When the papacy returned from Avignon and the pope again resided in Rome, the archbasilica and the Lateran Palace were deemed inadequate considering their accumulated damage. The popes resided at the Basilica di Santa Maria in Trastevere and later at the Basilica di Santa Maria Maggiore. Eventually, the Palace of the Vatican was built adjacent to the Basilica of St. Peter, which existed since the time of Emperor Constantine I, and the popes began to reside there. It has remained the official residence of the pope (though Pope Francis unofficially resides elsewhere in the Vatican City). Vincenzo Fagiolo and Pietro Palazzini, vice-rector of the seminary, were recognized by Yad Vashem for their efforts to assist Jews. An apse lined with mosaics and open to the air still preserves the memory of one of the most famous halls of the ancient palace, the "Triclinium" of Pope Leo III, which was the state banqueting hall. The existing structure is not ancient, but some portions of the original mosaics may have been preserved in the tripartite mosaic of its niche. In the center Christ gives to the Apostles their mission; on the left He gives the Keys of the Kingdom of Heaven to Pope St. Sylvester and the Labarum to Emperor Constantine I; and on the right St. Peter gives the Papal stole to Pope Leo III and the standard to Charlemagne. Some portions of the older buildings survive. Among them the pavement of medieval Cosmatesque work, and the statues of St. Peter and St. Paul, now in the cloister. The graceful ciborium over the high altar, which looks out of place in its present surroundings, dates from 1369. The stercoraria, or throne of red marble on which the Popes sat, is now in the Vatican Museums. It owes its unsavory name to the anthem sung at previous Papal coronations, "De stercore erigens pauperem" ("lifting up the poor out of the dunghill", from Psalm 112). The twelve niches created in Francesco Borromini's architecture were left vacant for decades. When in 1702 Pope Clement XI and Benedetto Cardinal Pamphili, archpriests of the archbasilica, announced their grand scheme for twelve larger-than-life sculptures of the Apostles (replacing Judas Iscariot with St. Paul) to fill the niches, the commission was opened to all the premier sculptors of late Baroque Rome. 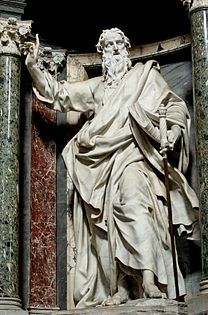 Each statue was to be sponsored by an illustrious prince with the Pope himself sponsoring that of St. Peter and Cardinal Pamphili that of St. John the Evangelist. Most of the sculptors were given a sketch drawn by Pope Clement's favorite painter, Carlo Maratta, to which they were to adhere, but with the notable exception being Pierre Le Gros the Younger, who successfully refused to sculpt to Maratta's design and consequently was not given a sketch. The Sarcophagus of Saint Helena, reused by Pope Anastasius IV, the only tomb to survive the Lateran fires. It is currently in the Vatican Museums. The Scala Sancta, or Holy Stairs, are white marble steps encased in wooden ones. According to Catholic Tradition, they form the staircase which once led to the praetorium of Pontius Pilate in Jerusalem and which, therefore, were sanctified by the footsteps of Jesus Christ during His Passion. The marble stairs are visible through openings in the wooden risers. Their translation from Jerusalem to the Lateran Palace in the 4th century is credited to St. Empress Helena, the mother of the then-Emperor Constantine I. In 1589, Pope Sixtus V relocated the steps to their present location in front of the ancient palatine chapel named the Sancta Sanctorum. Ferraù Fenzoni completed some of the frescoes on the walls. The anniversary of the dedication of this church has been observed as a feast in Roman Catholicism only since the 12th century, a time of increasing centralization of papal authority in the history of the Church. In the General Roman Calendar of the Catholic Church, 9 November is the feast of the Dedication of the (Arch)Basilica of the Lateran (Dedicatio Basilicae Lateranensis), and is referred to in older texts as the "Dedication of the Basilica of the Most Holy Savior". In view of its role as the mother church of the world, this liturgical day is ranked worldwide as a feast. Next to the main entrance is the inscription of the archbasilica's declaration to being the mother church of the world. ^ a b The archbasilica is within Italian territory and not the territory of the Vatican City State. (Lateran Treaty of 1929, Article 15 (The Treaty of the Lateran by Benedict Williamson; London: Burns, Oates, and Washbourne Limited, 1929; pages 42–66)) However, the Holy See fully owns the archbasilica, and Italy is legally obligated to recognize its full ownership thereof (Lateran Treaty of 1929, Article 13 (Ibidem)) and to concede to it "the immunity granted by International Law to the headquarters of the diplomatic agents of foreign States" (Lateran Treaty of 1929, Article 15 (Ibidem)). ^ "San Giovanni in Laterano". Giubileo 2000. Santa Sede - vatican.va. ^ "Papal basilicas". vatican.va. Retrieved 18 February 2016. ^ Pope Benedict XVI's theological act of renouncing the title of "Patriarch of the West" had as a consequence that the "patriarchal basilicas" are now officially known as "papal basilicas. ^ a b "Basilica Papale" (in Italian). Vicariatus Urbis: Portal of the Diocese of Rome. Retrieved 7 November 2013. ^ a b Landsford, Tyler (2009). The Latin Inscriptions of Rome: A Walking Guide. JHU Press. p. 236. Retrieved 21 October 2014. ^ Milioni, Albano (2007). L'Arcibasilica papale del Laterano nei secoli. Quasar. p. 142. Statuta Patriarchalis Archibasilicae Ss.mi Salvatoris ac SS. Ioannis Baptistae et Ioannis Evangelistae ad Lateranum Romanae Ecclesiae Cathedralis. ^ "Arcibasilica Papale San Giovanni in Laterano – Cenni storici" (in Italian). Holy See. Retrieved 7 November 2013. ^ Fr. Paolo O. Pirlo, SHMI (1997). "Dedication of St. John Lateran". My First Book of Saints. Sons of Holy Mary Immaculate - Quality Catholic Publications. pp. 265–266. ISBN 971-91595-4-5. ^ Fanny Davenport and Rogers MacVeagh, Fountains of Papal Rome (Charles Scribner's Sons, 1915), pp. 156 et seq. ^ Lunde, Paul (March – April 1979). "A Forest of Obelisks". Saudi Aramco World. Houston, Texas: Aramco Services Company. pp. 28–32. Retrieved 7 November 2013. ^ "The largest sculptural task in Rome during the early eighteenth century," per Rudolph Wittkower, Art and Architecture in Italy, 1600–1750, Revised Edition, 1965, p. 290, provides that "the distribution for commissions is, at the same time, a good yardstick for measuring the reputation of contemporary sculptors." ^ Cf. Michael Conforti, The Lateran Apostles, unpublished Ph. D. thesis (Harvard University, 1977); Conforti published a short resume of his dissertation: Planning the Lateran Apostles, in Henry A. Millon (editor), Studies in Italian Art and Architecture 15th through 18th Centuries, (Rome, 1980) (Memoirs of the American Academy in Rome 35), pp. 243–60. ^ Moroni, Gaetano (1840–61). Dizionario di Erudizione Storico–Ecclesiastica da S. Pietro sino ai Nostri Giorni (in Italian). 12. Venezia: Tipografia Emiliana. p. 31. ^ Respective biographic entries in "Essay of a General List of Cardinals". The Cardinals of the Holy Roman Church. .
Barnes, Arthur S. (1913). "Saint John Lateran" . In Herbermann, Charles (ed.). Catholic Encyclopedia. New York: Robert Appleton Company. Agostino Vallini (born 17 April 1940) is an Italian prelate of the Catholic Church. He has been a cardinal since 2006. From 2008 to 2017 he served as Vicar General of Rome. He is also the Archpriest emeritus of the Archbasilica of St. John Lateran. On 4 November 2017, Pope Francis appointed Cardinal Vallini Pontifical Legate for the Basilicas of Saint Francis of Assisi and Saint Mary of the Angels, both in Assisi, Italy. Angelo De Donatis (born 4 January 1954) is an Italian Catholic prelate who currently serves as Vicar General of Rome, Archpriest of the Archbasilica of St. John Lateran, and Grand Chancellor of the Pontifical Lateran University. He was the first person since the 16th century to be appointed Vicar General of Rome while not a cardinal. He initially held the rank of archbishop when appointed, until Pope Francis made him a cardinal on 28 June 2018. António Martins de Chaves (died 6 July 1447) was a Cardinal of the Catholic Church. He was bishop of Porto in Portugal. He was made cardinal on the 18 December 1439 by Pope Eugenius IV. He founded the church and hospice of San Antonio dei Portoghesi in 1440. Chaves was buried at the Archbasilica of St. John Lateran, where he was archpriest from 1444 to his death. His tomb was executed by Isaia da Pisa. Servant of God Augustus Tolton (April 1, 1854 – July 9, 1897), baptized Augustine Tolton, was the first Roman Catholic priest in the United States publicly known to be black when he was ordained in 1886. (James Augustine Healy, ordained in 1854, and Patrick Francis Healy, ordained in 1864, were of mixed-race.) A former slave who was baptized and reared Catholic, Tolton studied formally in Rome. He was ordained in Rome on Easter Sunday of 1886 at the Archbasilica of St. John Lateran. Assigned to the diocese of Alton (now the Diocese of Springfield), Tolton first ministered to his home parish in Quincy, Illinois. Later assigned to Chicago, Tolton led the development and construction of St. Monica's Catholic Church as a black "national parish church", completed in 1893 at 36th and Dearborn Streets on Chicago's South Side. Charles Reynolds (c. 1496 – July 1535) was an Irish-born Catholic cleric. Born in County Leitrim, Reynolds entered a religious order and was appointed to influential posts as archdeacon and chaplain to the Earl of Kildare. His name in native Irish is Cathal Mac Raghnaill, but he anglicized his name to Charles Reynolds in order secure ecclesiastical benefices under English laws. He was educated at the University of Oxford and fluent in English, Irish, and Latin. Reynolds opposed Henry VIII of England's separation from the Catholic Church, declining to acknowledge him as Supreme Head of the Church of England and refusing to acknowledge the annulment of his marriage to Catherine of Aragon. During the Kildare Rebellion of 1534–5 against King Henry, Reynolds was dispatched as envoy to Rome to seek support from the pope. In May 1535 he secured a papal promise to excommunicate King Henry of England. Reynolds died of an "incurable fever" and was buried in Archbasilica of St. John Lateran on 15 July 1535. The inscription on his grave slab in Rome, gives accurate dates for his birth in Ireland, death in Rome, provides a family setting, and reveals the pope intended to consecrate him bishop. Reynolds was posthumously attainted of high treason in 1536. The Clementine Chapel, also known as La Clementina, is a particular Roman Catholic chapel located within the underground necropolitan grottoes of Saint Peter's Basilica in Vatican City. It is the area where the relics of St. Peter were venerated in early medieval times, before his skull was removed to be housed at the Archbasilica of St. John Lateran. Duomo (English: , Italian: [ˈdwɔːmo]) is an Italian term for a church with the features of, or having been built to serve as, a cathedral, whether or not it currently plays this role. Monza Cathedral, for example, has never been a diocesan seat and is by definition not a cathedral. On the other hand, the city of Trevi no longer has a bishop, although it once did, and the erstwhile cathedral of Emilianus of Trevi is now a mere church. By contradistinction, the Italian word for a cathedral sensu stricto is cattedrale. Many people refer to particular churches simply as il Duomo, "the Duomo", without regard to the full proper name of the church. Similar words exist in other European languages: Dom (German), dom (Romanian), dóm (Hungarian and Slovak), dôme (French), domkirke (Danish and Norwegian), dómkirkja (Icelandic), domkyrka (Swedish), domo (Portuguese), doms (Latvian), toomkirik (Estonian), tum (Polish), tuomiokirkko (Finnish) and so on. Also in these languages the respective terms do not necessarily refer to a church functioning as a cathedral, but also to proto-cathedrals or simply prominent church buildings, which have never been a cathedral in the exact sense of that word. German Dom and Polish tum became the synecdoche used — pars pro toto — for most existing or former collegiate churches. Therefore, the uniform translation of these terms into English as "cathedrals" may not always be appropriate and should be used on a contextual basis. According to the Oxford English Dictionary and the Zingarelli, the word duomo derives from the Latin word domus, meaning "house", as a cathedral is the "house of God", or domus Dei. The Garzanti online dictionary also gives the etymology as deriving from "house", but "house of the bishop" instead. Italian cathedrals are often highly decorated and contain notable artworks; in many cases the buildings themselves are true artworks. Perhaps the best known duomo is the one in Florence, but other well-known cathedrals include the Milan Cathedral, Archbasilica of St. John Lateran and those of Siena, Alba, Ancona, Mantua and Parma. Ercole Bernabei (Caprarola (Latium), 1622 – Munich, 5 December 1687) was an Italian composer, chapel master and organist. Bernabei was born in Caprarola, and became a pupil of Orazio Benevoli in Rome. From 1653 he served as organist at San Luigi dei Francesi as successor of Luigi Rossi. In July 1665 Bernabei was appointed maestro di cappella at the Archbasilica of St. John Lateran. And from 1672 to 1674 he hold this post at the Cappella Giulia in St. Peter's Basilica thanks to the protection of Christina, Queen of Sweden. In Juli 1674 Bernabei and his pupil Agostino Steffani moved to Munich, where he superseded Johann Caspar von Kerll as Hofkapellmeister of Ferdinand Maria duke of Bavaria and an elector (Kurfürst) of the Holy Roman Empire. His daughter married another expatriate Italian musician, Gio Paolo Bombarda. He was father to the composer Giuseppe Antonio Bernabei (Rome, 1649 – Munich, 9 March 1732). Ercole Bernabei died in Munich on 5 December 1687. 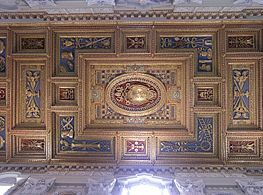 Following the Lateran Treaty of 1929, the palace and adjoining basilica are extraterritorial properties of the Holy See. A major basilica (Latin: Basilica maior; plural: Basilicae maiores) is one of the four highest-ranking Roman Catholic church buildings, all of which are also papal basilicas: the Archbasilica of St. John Lateran, St. Peter's Basilica, the Basilica of St. Paul Outside the Walls, and the Basilica di Santa Maria Maggiore. All of them are located within the diocese of Rome: St. Peter's Basilica is located in Vatican City and thus within the territory and sovereign jurisdiction of the Holy See. The other three are geographically located in Italian territory, but enjoy extraterritorial status under the Lateran Treaty. 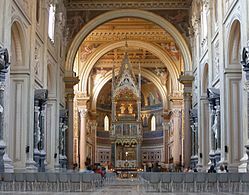 The Archbasilica of St. John in the Lateran is the seat of the Pope and the site of the Papal Cathedra, and is the oldest and first in rank of the major basilicas. All other churches that have the title of basilica are minor basilicas (Latin: basilica minor). Michael Smith (born 6 June 1940) is the retired Roman Catholic Bishop of Meath, Ireland. He was ordained priest in the Papal Archbasilica of St. John Lateran on 9 March 1963 by Cardinal Traglia, Cardinal-Bishop of Albano. He celebrated his first mass on 10 March 1963 in the Clementine Chapel, located under the Altar at Papal Basilica of Saint Peter. For others of this name, see Neri Corsini (disambiguation). Neri Maria Corsini (19 May 1685 – 6 December 1770) was an Italian nobleman and Catholic priest and cardinal. Pompeo Targone (1575 — ca. 1630), son of a Venetian goldsmith, was an Italian engineer in the service of popes Clement VIII and Paul V. He built the ciborium tabernacle in the Blessed Sacrament chapel of the Archbasilica of St. John Lateran, and one of the altars in the Basilica di Santa Maria Maggiore.Targone gained notoriety for his inventiveness as a military engineer in the Siege of Ostend (1604) and the Siege of La Rochelle (1627-1628). Targone proposed to block the channel leading to the harbour of La Rochelle in order to stop all supplies to the city, but his structure was broken by the winter weather, before the idea was taken up by the Royal architect Clément Métezeau and the Parisian mason Jean Thiriau. Targone has also been credited with the invention of the field mill in Vittorio Zonca's treatise on mechanical arts. Pomponio Cecci (died 1542) was an Italian Roman Catholic bishop and cardinal. The San Giovanni Addolorata Hospital (also known as Azienda Ospedaliera San Giovanni Addolorata), is a hospital located in Rome, Italy, behind the largest standing ancient Egyptian obelisk in the world and the Archbasilica of St. John Lateran. It is one of the biggest hospitals in Central Italy. Vincenzo Santucci, also Vincenso Santucci (18 February 1796 - 19 August 1861) was an Italian cardinal, who spent his life serving in the Roman Curia.